This file photo taken on February 3, 2015 shows the Democratic Republic of the Congo's President Joseph Kabila attending a training session of his country's football team in Bata. Tensions remain high as the scheduled presidential election date approaches in the Democratic Republic of Congo. All sides agree that elections will not take place in November as planned, but the question remains: how long will the public allow President Joseph Kabila to remain in office without standing for reelection? The outer time limit for the election was set recently by the DRC’s Independent National Election Commission (CENI) which said it needs until December 2018 to complete the work of registering all voters and readying the country for an election. 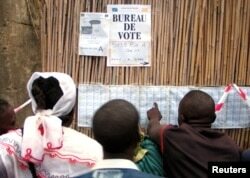 FILE - Congolese voters check their names on a list before casting their ballots in Bunia, eastern Democratic Republic of Congo, July 30, 2006. By contrast, members of the political opposition and diplomats from the United States and Belgium have called for a 2017 election date. After a two-week-long closed door meeting, a coalition of opposition members from the Democratic Republic of the Congo emerged to demand the resignation of the president. In fact, they announced that if President Joseph Kabila stays in office past the end of his second term on December 19 they will give him a “red card” and eject him. Etienne Tshisekedi, a veteran politician and leader of the opposition group known as the Rassemblement, said the time has come for an honest and all-inclusive national dialogue. 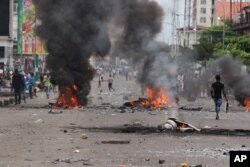 The event came just weeks after protests organized by the Rassemblement turned violent and led to the deaths of about 50 people after clashes with security forces. Now, says Jason Stearns, director of the Congo Research Group and senior fellow at New York University, it’s time for a negotiation. “It’s pretty clear that the President Kabila government wants the election to be held as late as possible,” Stearns said. What should happen in the interim? Kabila’s second term in office expires on December 19 and Congolese appear split on whether he should remain in office until elections are organized. 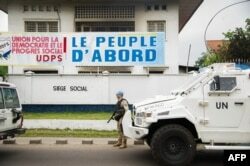 A Kabila-backed "national dialogue" boycotted by many opposition parties has failed to resolve the issue. The constitution is inconsistent on the subject, says Joseph Siegle, director of research at the Africa Center For Strategic Studies. The document says that the president should step down and allow a caretaker government to hold office after his mandate ends, and that the president can retain his office until a new leader is elected. Stearns believes the court’s ruling was incorrect and says the constitution prescribes that until an election is held, the president of the Senate should be allowed to form an interim government. As violence increases and Kabila shows no signs of budging, some are calling on the international community to force the issue of democracy in the DRC through sanctions and diplomatic pressure. Last month the U.S. Treasury Department issued targeted sanctions against two individuals. John Numbi, inspector general of the Congolese National Police, was designated for using violence and intimidation to help his preferred candidates win local elections. 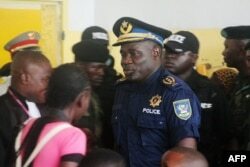 FILE - Former Kinshasa police chief, John Numbi, (C) walks into court on Jan. 27, 2011. Numbi was one of eight police officers accused of the death of human rights activist Floribert Chebeya in January 2010. Gabriel Amisi Kumba, a former general in the armed forces, was sanctioned for being the leader of an armed group that threatened the peace, security, or stability in the country, said the department in an email response to VOA. The sanctions, said the department, are based on a well-documented record of violence and harassment and intimidation of individuals to exercise their democratic rights and fundamental freedoms. The Office of Foreign Assets Control previously designated Céléstin Kanyama, a Congolese government official on June 23, 2016. Stearns said that freezing assets and a travel ban in this case are largely symbolic since these individuals aren’t believed to have U.S. assets. “In the past, every time the international community has put pressure on Kabila, he calls the bluff and says, ‘So what?’ So now the U.S. needs to show Kabila that there is actually something that’s going to happen and these sanctions are signs of that,” he said. Siegle agrees that there needs to be more pressure in order for a democratic process to prevent more violence. People walk near burning debris during election protests in Kinshasa, Democratic Republic of Congo, Monday, Sept. 19, 2016. “The international community is going to need to do more to signal that the expectations are for President Kabila to respect the term limits and to allow the electoral process to proceed and that this is a norm that democratic countries adhere to. This is something that the African Union has indicated is part of its charter on democracy, governance and human rights on the continent,” said Siegle.